Let's Hear It For Hufflepuff! We've had it with people underestimating Hufflepuff. Or, we're as irritated as a Hufflepuff really gets. Which is not that irritated because Hufflepuffs are a particularly chill type of person. While some might think that life as a badger is nothing to write home about, they probably haven't thought about how awesome the Hufflepuff lifestyle actually is. For one, have you seen the commons? The room is warm year round and accented with green plants throughout. While Gryffindor kids have to huddle around the fireplace in mid-winter, Hufflepuff students are comfortable where ever they decide to study. Another issue that brings the Hufflepuff cozy nature to a whole new level? Their common room is basically connected to the kitchens. They have the ability to raid the kitchens while the rest of the castle lives off chocolate frogs. Hufflepuffs work plenty hard but they sure know how to live it up as well! 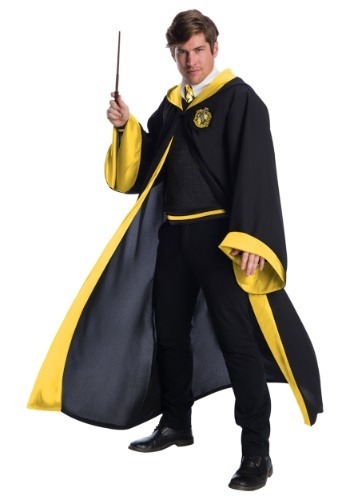 This richly detailed Hufflepuff costume will do you proud as you step forward to receive rewards in Herbology. 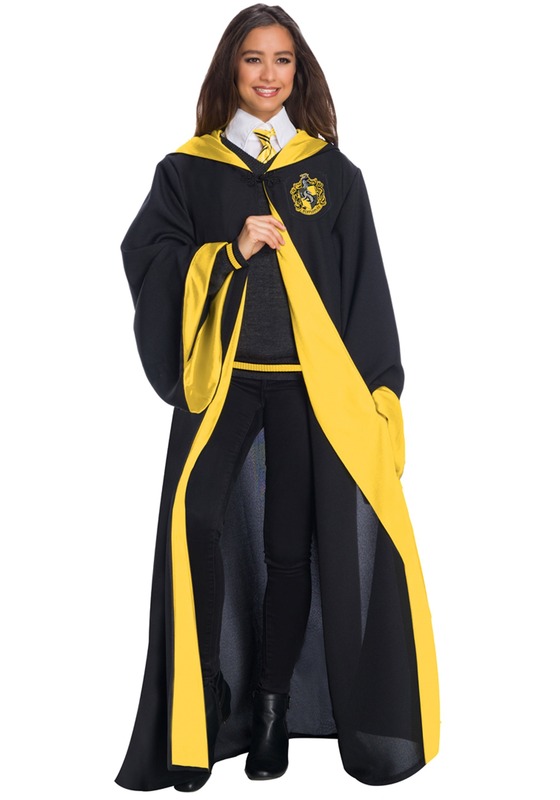 Join the ranks of Nymphadora Tonks and Cedric Diggory when you throw on this black and gold robe. It has a wide warm yellow border so people can tell which house you belong to from far away. Finish off your look with the gold trimmed black sweater and the black and gold tie and you'll be ready to impress. You might even earn five points for Hufflepuff! Are you into the idea of getting some dirt under your fingernails as you earn an "O" in school testing. We don't know why muggle schools aren't offering herbology yet, it's a great way to learn about the world! It's not like this past time is without its dangers. After all, you wouldn't want to accidentally dig up a mandrake, expecting a daikon radish. So get out there and exercise that green thumb, you can veg out in those cozy commons later.